Welcome to my shop, where you will find a growing collection of tried and tested resources for A level English language teachers. In my 29 years of teaching English at key stages 3, 4 and 5, I led two very succssful English departments before becoming the head of a very large sixth form (600+) and then a deputy head teacher. In addition, I spent many years as a senior examiner for the AQA (English). I now work as an educational consultant and also in ITT, among other things. A comprehensive glossary of A level English language terminology with more than 540 entries covering all aspects of the course. Created for the AQA course, but relevant for all specifications, it includes key theories as well as language level terms (grammar, pragmatics, lexis &amp; semantics, phonology, discourse, graphology). With its clear explanations and useful examples, this is a great reference tool for you and your students during A level study. It is also an excellent revision aid prior to exams. You can quickly jump to each alphabetical section and back for easy access to all terms. Designed for A level English language students, but great for their teachers too, this pack explains all aspects of English grammar: morphology word classes phrases clauses sentences With really clear, easy to understand explanations, helpful examples and links to practice activities on the excellent UCL Englicious grammar site, this is a great reference guide for students and teachers. It’s great for revision, too, and can even be used to help with KS2 SAT preparation! This presentation explains the different sentence types and functions in a clear and attractive way. It’s great when introducing your A level students to this aspect of grammar, and also as a handy revision tool as well! A bright and clear explanation of grammatical clauses, which is equally useful as part of an introduction to grammar and as a revision tool prior to exams. A clear and easy to understand explanation of grammatical phrases. This is great for your A level students, either as an introduction, or as a revision tool prior to the exams. Show your students how morphemes are combined to form words with this simple, clear Powerpoint presentation. It works really well as part of an introduction to grammar, and also as a revision tool prior to the exams. This bargain pack includes all six grammar introduction PowerPoints, covering morphology, word classes, phrases, clauses, verb voice/tense/aspect/mood and sentences at a reduced price. Use it at the start of teaching your A level students about English grammar, or as a revision aid nearer the exams. This presentation deals with the often challenging concepts of verb voice, tense, aspect and mood. 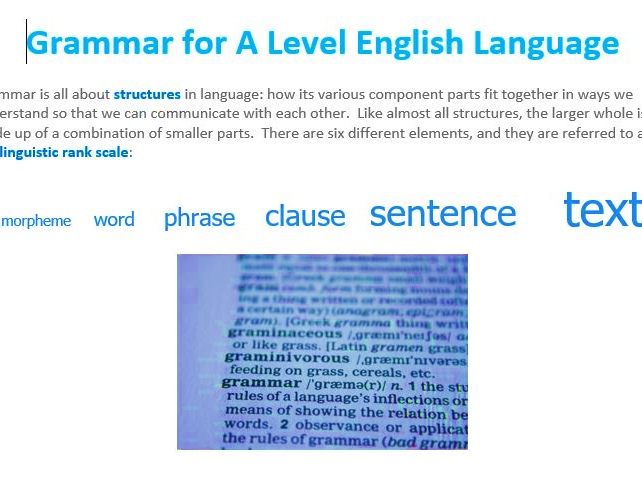 You’ll find clear, easy to understand explanations and helpful examples for your A level students to help them at the start of their study of grammar and for their revision, too! Use this PowerPoint to introduce students to the main word classes. Works well as a revision tool as well.